I bet 95% of the people that read this update had woken up later than I had today. It surprised me I woke up without an alarm at 5.20am. A beautiful site to see the orange morning sun glow on the prairie hills. Laura, Josh and me had set up the array, the amps were pumping into the car again. I brought my sleeping bag out and fell asleep on the prairie grass, it was peaceful with the birds singing and sun gleaming on my face. It was not long after Marcelo and Claire woke up. We drove off with a good battery charge, happy faces and soymilk. After about 50 miles we decided to by groceries and top of the batteries. I walked into a local casino to ask them for sponsorship and wooohooo we received free t-shirts and not totally unimportant snow globes (just what we needed!). Thank you Living Sky Casino! The second attempt was at Wal-Mart with the help of Laura. Unfortunately the store manger wasn’t there so better luck next time! Before I go to the next part it just needs to be said: Saskatchewan Berry pie is AWESOME! We left Swift Current and drove for another good couple of hours. Final stop of the day was just past the border of Alberta in a small town called Walsh. (population 65) Marcelo was still in contact with the people he met last year when he zoomed by on his first trip to the Arctic Circle. What a great community, they were expecting us and the barbeque had already started as we arrived. We had a great evening around the fire, grilling sausages and carrots. Around 11.00pm we left to bed and we were divided over two houses, two neighbors actually. Thank you very much Jo-Lene, Nelly, George, Christen and family! It was a very nice evening but after an early morning it was time to hit the hay. We blow bubbles at the morning sun. The delicate orbs pop on the wild grass, reflect rainbows on the solar cells and make the wide open plains even more whimsical. Passing so many miles of grassy mounds with windy indentations and specks of grazing cattle in the distance, I start to daydream. Looking out the window I envision myself taking a roll down the knolls, maybe in a big monster truck tire, laying inside the wide rubber innard as it bounces and cruises through the grass. The salt mines break up the continuous green on the way to Alberta. We stop in Swift Current for supplies and lunch. A sweet Saskatoon berry pie satiates our hunger with local flare and lasts a whole 10 minutes with our ravenous sugar lust. After crossing into Alberta from Saskatchewan we locate Joleen’s house and are welcomed by her neighbors and swarms of mosquitos at dusk. After introductions and mosquito dances we circle around the outdoor fire pit at Chris’ place and enjoy some hot fired supper and coffee. Stories weave in through Josh’s ukulele playing and we learn the origin of the town Medicine Hat just east of Walsh. There was a war between native tribes in the area many years ago and the medicine man’s hat was lost. It was found down the river some miles at the site of what now is the town named for the find. I delight in the tidbits of history acquired on these travels. Just yesterday one firefighter was telling me about the town of Moose Jaw. It was a hideout for Al Capone during prohibition. What is now the Seagrams Gin company were once the family that produced and supplied most of the alcohol that traveled underground from Moose Jaw to Chicago. After goodnights and hugs I am happy to get a hot shower and even more joyful for a real bed at Joleen’s lovely house. Today was an exciting day as always but some upsetting personal news graffitied my good mood. The crew was there to comfort and support. Willy Wonka cheers me up with a story about a frozen bird and his big tree branch arms around me. We are a family brought together by the light of the sun, supported by the kindness of strangers, not letting any obstacle keep us from following the dream. After breakfast I sat on the gravel offshoot of the highway, shaded by the shrinking shadow of the trailer with a laptop on my leg desk. The powerline poles that lined the railroad tracks we took pictures on the night before looked as if they were plowed down in the dirt by a giant who was in some kind of hurry. Traveling to this point, the land finally broke from its flat habits and started to protrude and sink without rhythm. There were sporatic, sprawling blotches of yellow wild flowers and fields and waterbanks coated with pure salt. For a pinchful of petty reasons I was feeling a bit frustrated during the day, with the computer being a prime target in my sights. I finally realized, after too long, that the energy spent on coaxing an inanimate object into a duel is just not worth the outcome. Moreover, I found it very hard to maintain an ill state of mind amid this kind of scenery. The rolling grasslands were dotted with small herds of cattle while monstrous rays of sunshine dropped down through the clouds. At one point, Marcelo pulled over in front of a pasture with eight or so horses near the fence. As soon as we stopped, ears perked and all of them gathered up to the fence for a closer look at the automotive development in alternative energy systems. We stopped in Swift Current at plaza parking lot to charge up the car and do some errands. I worked on updates (in partnership with the my electronic nemisis), chatted with solar onlookers, filled up the water jug at Burger King, and talked to my sister on the phone. The others got groceries and a few other supplies. Willy's charm didn't let us down either. He told the nearby casino about xof1 who said they couldn't sponsor us but that they could give us a couple of their gift bags. The boys have already used the shirts, I have used the pens, but we haven't yet utilized the casino snow globes!! But thank you!! Once we approached the city of Walsh, Marcelo's simple instruction was to 'follow me.' He took us down a couple narrow, people-less roads lined with abandoned businesses and older homes until the last street, which seemed like a Walsh spin on Plesantville. Neat, simple homes with white picket fences and front yard displays. We were heading to Jolene's home, a woman who Marcelo met last year on this tour and was excited to see again. Later on, I heard her neighbor comment that 'hospitality is her thing.' I have learned to not ask questions about what is going on, so I followed the pack down a couple houses to find that Jolene's neighbor, Chris & Rosalie and family had set up an open fire picnic dinner for us. It's always a funny moment when I find myself in established lands of meat and I pause awkwardly as they hand me a smile and a hotdog to disclose that I am a vegetarian. I can't imagine what they were thinking when I said that and then there were three more "me too"'s, they must have thought it was some kind of joke. They were more than accomodating, making grilled cheese sandwiches, bringing out a platter of fruit, and offering the vegetarian baked beans they bought by accident. Willy volunteered to make up for our combined meat definciency by clearing a couple burgers and a hotdog. Other neighbors, Nellie & George, joined us for a bite and Jolene came over for a coffee before she left for work. It was a good time, thank you so much! Around 11pm all of us were hunching forward on our firestide stumps. I elected to rely on the same questionless code as before and followed my gang over to Jolene's where sleeping arrangements were determined. I would be sleeping in Nellie and George's basement with Josh, who I forewarned that he would be doing a very early morning stumble out to the camper if his snoring strips failed. Josh did a midnight concert for the waning party of three on the piano. I could almost see the vibrations as the music pounded on the walls. Josh is one of those envyingly annoying people that plays by ear, translating most any song on an array of instruments. George showed me pictures of the snow storm they had last June and Nellie showed me all her treasures adoring every wall of the basement. She has done every craft known to man, even painting the floor of the basement to mock the ocean then beach then green land. The things that caught my eye most were some picture frames she made out of scrap chunks of wood. With all natural elements of the piece maintained, she took a saw to the center and placed a black and white photo inside. I pointed my two favorite out and she didn't hesitate to reach up and hand one over to me. It's a bleached out picture of an old barn taken low down behind a mound of tall grass, "Best wishes on all of your life's journeys," she wrote on the back. Thanks you so much, Nellie and George, it was an absolute pleasure. I woke up today to a beautiful sunrise over an old dirt road. I spent the day driving by the solar car for some of the best landscapes I've ever seen. We passed by a beautiful herd of horses, who came to the barbed wire fencing to pose with the solar car. Livestock was to be found grazing all over the expansive rolling hills and green pastures that we encountered on our way to Alberta. 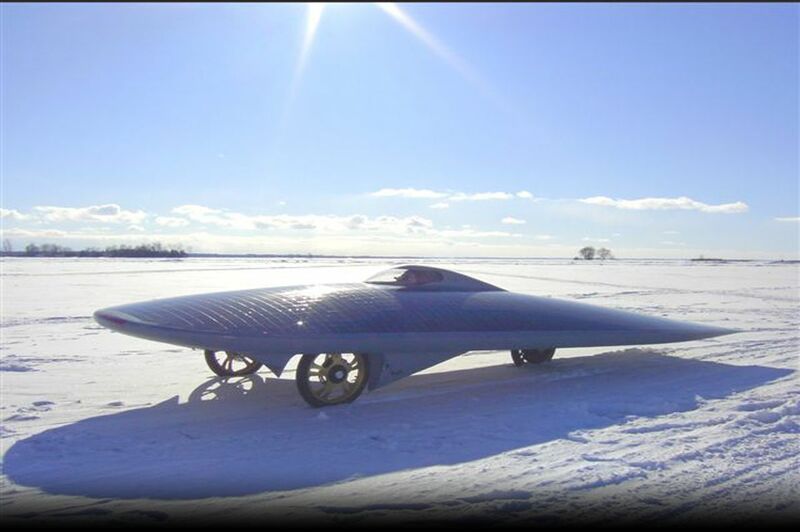 Once crossed over into Alberta province, we got some pictures of the solar car as it passed a massive wind farm. Seeing both Canada and America embrace renewable energy is heartwarming and encouraging for me, and hopefully the spirit of progress, innovation, and change. It was great to have finally traversed two Canadian provinces now, and I am so happy to be able to take in the scenery from behind the wheel. We arrived in Walsh, which was one of the towns Marcelo had visited last year. Not having a phone number to contact, he simply drove right through the small town, right up to the place he had stayed a year ago. We met with Joleen, Nelly, George, Chris and Dorothy Sauer, and other town folk. After checking out Joleen's beautiful home, we went to a nice fire set up by Chris and Dorothy for some food, songs, jokes, and all around good times. I sang a little "Tutti Frutti" ala Elvis Presley, before going with Claire to check out the sleeping arrangements with Nelly and George. Nelly showed me her beautiful and extensive arts and crafts collection, intriguing Claire in the process. Seeing as Claire works at her family owned antique shop, she probably really enjoyed checking out all the different things around the basement. George showed me some wonderful paintings by local artists including some that Nelly had done. Many of the paintings were of local landscape, and one even included a professionally bronzed horseback rider that a friend of his had done. I was thrilled to play on their piano, which I hadn't done for some time now. I played a Liebestraum by Franz Liszt, The Maple Leaf Rag by Scott Joplin, and Solfeggietto by Carl Philip Emmanuel Bach. I talked a bit with Nelly about particle physics, religion, politics, and the general status quo for a bit, and we then decided we had to say goodnight to Marcelo. Claire and I descended to the basement to start some laundry, and George showed me the fountain and tulip garden outside before we went to talk to Marcelo. We looked over some pictures from a couple of days ago, and then we promptly went to bed. Claire seemed a bit hesitant to endure my snoring, but with some nose strips, and good health, I think we may just make it through the night. Otherwise, I'll have to find a cage outside to encase my rip-roaring snoring self. As it turned out, our overnight stop was a great place to be. Occasionally, an occasional train would go by, tall grass, rolling hils, fences, as if we were in a set of an old western movie but modern trains and next to a highway instead of a trail. Willy Wanka, Josh and Laura got up early to set up the array. I was counting the miles to get to Walsh, looking forward to seeing Nellie, George and Jo-Lene. It was a bright shiny morning, we got on the road a bit late, waiting for a team member to catch up on updates. Saskatchawen has good roads, flat and smooth, I just had to deal with the constant prairie winds. No moutains but it has its beauty, I like the open space as much as I enjoy mountain terrain. We made a stop in Swift Current to buy groceries, everything is a lot more expensive. I wonder, how some people can afford to live here. I suggested Willy to try the local Casino for sponsorship, he didn't think twice. Armed with his enthusiasm he was knocking at the Casino door. About half hour later, he walks back with a big smile carrying 5 red bags, each with one snow globe, one pen and one red casino t-shirt. His effort for sponsorship didn't end there. Our only high definition camera broke down, Willy and Laura went to Wal-Mart to see if we could get a replacement at a discounted price or even get it sponsored, it didn't pan out. Kudos Willy and Laura for giving it a try! A haze covered the entire sky, yet it was still very bright. We got back on the road, the haze turned into clouds, gigantic storms around us. It was impressive to see the rain falling far in the horizon, not sure if we were going to be caught on it or not, we kept pressing on. Fortunatly, we arrive in Walsh dodging the bad weather. At last I was back in Wash, it has been one year. Being such a small place it was easy for me to find my way around, about 30 or so houses, and only a few streets. Stopped in front of Jo-Lene's home, knocked at the door, a few minutes later, Jo-Lene came out wearing her pj's. We said our hellos and right away she called Nellie and George next door, they came over before I could step outside Jo-Lenes home. We were all happy to see each other. So much to talk about, so little time. We parked the solar car, van and the trailer on the lot next door. No point in setting up the array, it was getting late and the sun was playing hide and seek behind the clouds. Chris, invited us for dinner, the fire pit was blazing burgers, hot dogs and anything else we want to throw at it. Josh played the Ukelele and made an attempt to get everyone singing but we all agree that was more enjoyable to here him. Tomorrow, we'll be having a potluck breakfast at Nellie and George's home. Flora (the UFO lady will be joining us), can't wait to meet her in person. The Xof1 enjoying some bubbles. Horses dropping their draws at the solar car. One of the most beautiful herds of horses the tour has seen. They all stared at the solar car and its crew members. Winding ways, and hilly trails. Claire is having the time of her life as Laura goes to bed. Claire carrying clean water for everyone. Josh is slicing up some radishes he got from some some German folk. "Yes I'm relaxing in the back, you gotta a problem with that?" It didn't stand a chance to the ravenous solar crew. Willy licked that pan clean. We better come out of this city with a serious cranial accessory cures. Laura has the biggest mouth of us all. Trust us, we took some measurements. Marcelo testing out another walkie talkie. The eye of the duct tape sees all. How does he fit in there? Sun rays shine through the storm. A beautiful horizon opens up for the solar car. The sun soaks the Xof1 in light..
We've finally come to Alberta! Our fire pit weenie roast and ukulele jam with the residents of Walsh.